Greetings friends, we are excited to announce our new first map release as part of the Alpha Assault Pack Update! The Terrarum Data center is a four story underground facility, with long corridors and a strong focus on verticality, rewarding players who employ methodical tactics. The RG-9 SMG brings a compact Submachine gun into your arsenal. Lastly tons of bug fixes and polish has been added! Thanks again for your support. 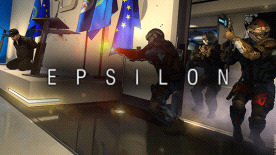 Joining EPSILON Early Access is a chance to experience the game as it evolves throughout its development process. Be aware that our Early Access offer is a representation of our core pillars, and the framework we have created around them. It is a work in progress and therefore contains a variety of bugs. We STRONGLY advise you not to buy and play the game at this stage unless you clearly understand what Early Access means and are interested in participating in the ongoing development cycle.